Learn more about how helicopters can benefit your agricultural operation in Ohio. Today aerial applications are known as crop dusting, but the process has been around since the early 1900s. It was first used by hot air balloons in 1906 to spread seeds. By the 1920s, the US Department of Agriculture and the Army began experimenting with its uses. While planes have been widely used in the past, helicopters are fast becoming the vehicle of choice in aerial applications in Ohio. Helicopters, unlike airplanes, have access to a wider range of locales and actually deliver a more precise application when it comes to pesticides and herbicides, reaching the underside of plants where pests and funguses typically hide. This mode of transportation also provides commercial farmers and growers a more diverse array of options including frost prevention, watering, seed spray, and more. FairLifts can reserve aerial applications that are effective and timely in Ohio. Of course Ohio is known as the birthplace of the first man to walk on the moon, Neil Armstrong, but the Buckeye State has many other claims to fame. The state is home to both the Pro Football and the Rock and Roll Hall of Fame. While Clark Gable and Steven Spielberg were also born in Ohio, this high-flying state is pretty well known for its dairy production and its agricultural crops. Soybeans and corn are Ohio’s largest crops, but potatoes, cucumbers and tomatoes are high-grossing cash crops as are apples. Many farmers also grow large crops of wheat, hay and oats to feed its dairy-producing livestock. Helicopter sprayings like crops dusting, pest and weed control as well as drought and frost prevention are vital to Ohio’s prosperous farmers and growers. Deciding to utilize helicopter spraying options in Ohio is both a cost-effective and efficient choice that will benefit farmers and growers. Aerial application is the best option when it comes to managing commercial and private farms. FairLifts is the go-to resource to discover the ideal helicopter service to suit your particular agricultural needs, providing access to a vast network of aerial application alternatives. The term crop dusting in agriculture encompasses a wide range of services that includes helicopter spraying of fungicides, pesticides and herbicides. Crop dusting also provides seed spraying during growing season as well as watering options when Mother Nature doesn’t cooperate. Aerial application services in Ohio offer all these crop dusting options that work together to keep farms prosperous and fertile. Pests can be disastrous to crops, causing thousands of dollars of damage. In recent years, beetles have been a major problem for Ohio strawberry farmers. Proactive helicopter spraying is vital for crop maintenance, preventing beetles, caterpillars, grasshoppers and moths from overtaking crops. Mosquitoes have long been an annoyance for Ohio farmers and residents, carrying deadly diseases in addition to the annoying bites. Regular mosquito helicopter spraying keeps these irritating pests at bay. Even a novice gardener understands that weeds rob plants and flowers of vital nutrients, sunlight and water. Weeds also grow like wildfire, making it paramount to keep them in check. Unlike a small backyard garden, a farmer simply cannot control weed and brush growth by hand. 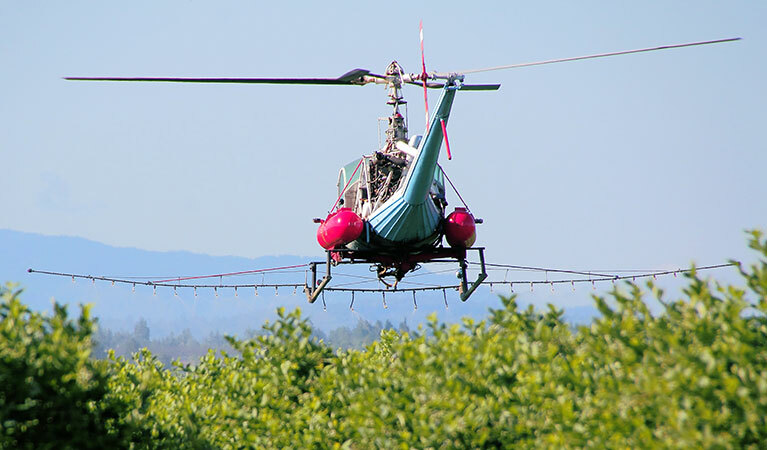 Aerial applications of herbicides is a necessary element of agriculture. It is much more effective and less time-consuming than launching a ground assault on weeds by hand. An early or late frost is a real issue in Ohio unlike some warm weather states. Frost prevention options like smoke production and strategic water spraying protect plants and keep them from freezing. Frost can permanently damage plant cells causing irreversible damage to valuable crops. Make sure your farm is protected this fall and spring with aerial frost prevention and treatment options. FairLifts can help commercial and private farmers and growers procure the aerial applications services they require throughout Ohio. We can connect you with the always growing network of top helicopter spraying pilots and operators in the Buckeye State. Contact FairLifts by telephone or our online contact form for a free quote or consultation. We are also always available to answer aerial application questions.